It's just under four years since we moved into the house, and unpacking proceeds apace. We left our LPs in boxes since we moved because we didn't have anything to hold them other than the wooden crates we'd been using before. I really wanted to make something nice to hold them, and I really intended to do it long before now, but, well, you know.... 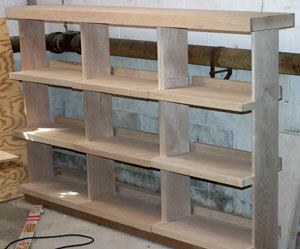 Anyway, last autumn I started working on a bookcase to hold all our LPs. I came up with a design, got the wood I needed, and set to work. 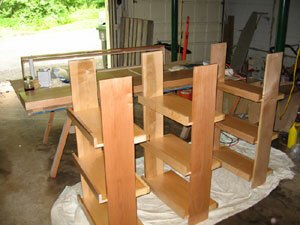 I made it in maple, with maple plywood for the shelves and dimensional lumber for the supports and trim. By September, I had the actual construction finished. I really wanted to make sure these came out well, so I took some time to research finishing, since this was my first really serious piece of furniture. I decided that tung oil was the way to go. Unfortunately, by the time I figured this out, it was cold out, and you need to apply tung oil in a well-ventilated place at a reasonable temperature. This means the garage, and it was too cold to do by that time. So the bookcase wintered in the basement. By May, the temperatures outside were reliably warm enough for long enough stretches that I figured I could do the work. 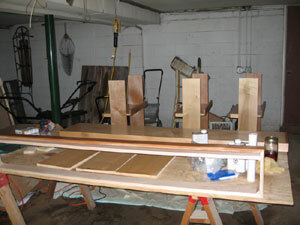 I moved my workshop out to the garage, did a final sanding of the pieces. I built the bookcase in five pieces, three carcasses of shelves, a frame for the toe kick, and a cap to sit on top and unify the whole thing. That way I could carry it into the house by myself piece-by-piece and assemble it in the spare bedroom that serves as our media library. It took me about two weeks to apply the finish to the wood. I started with a couple of coats of sealer, which has a dull finish, and then added five or six coats of a glossier coat. The oil seeps into the wood and hardens with exposure to air. Each coat needed about 24 hours to dry, so I was limited to one coat a day, which took me just under an hour to apply. By last weekend, I had completed the finishing. On Sunday morning, I moved the dried and finished pieces of the bookcase into the living room so I could assemble it at my leisure. I had to move the boxes of LPs out of the way first, but by Sunday evening I was able to place the toe kick frame in the room. Monday evening, I put the rest of the pieces in place, tested to make sure the cap fit correctly while also extending back to the wall, then removed the cap and glued the tops of the carcasses into place where they would ensure that the cap fit as intended. 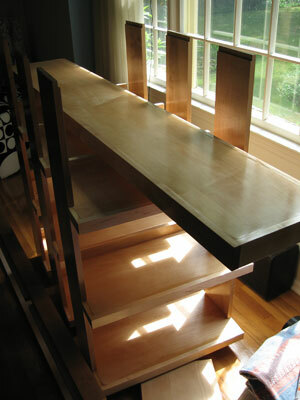 By Tuesday morning, I was able to place the cap on top and declare the bookcase installed. 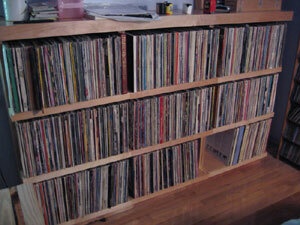 It took me a couple more days to unpack the 16 boxes of LPs. Mine were largely alphabetized already, so that wasn't too bad. Laura's weren't, so I alphabetized them and integrated them so that we can find anything we want quickly. I'm really happy with the way the bookcase turned out. There are roughly 18 linear feet of shelves holding somewhere in the neighborhood of 2000 LPs, and as you can see, I did a pretty good job of estimating how much space we needed. There's not a whole lot of extra space. It took rather longer than I expected to finish, but I'm pleased with the end result. It probably wasn't the most efficiently made piece of furniture; with a bit more experience, I probably could have lessened the amount of raw lumber I used on the piece by creating better cutlists that left less scrap wood, for example. I could point out the errors and flaws, but mostly they don't matter because they're hidden by the records, and besides, I think more worked out well than didn't with this. I had a lot of fun making my first serious piece of furniture. I don't know that I'll make a lot of furniture for the house, but I definitely have plans for at least a couple more pieces. 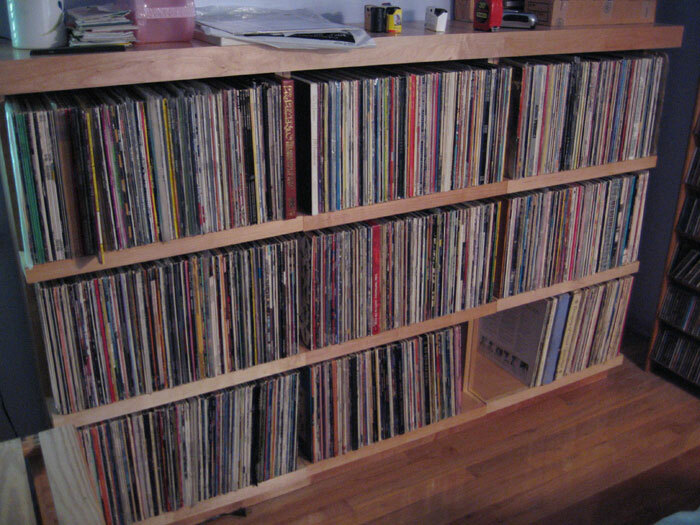 I love your LP shelves: a beautiful execution of a simple and elegant design. So, what's your most treasured LP of the group? Thats a really simple, good looking storage case for CD's. I like the modular design and the scale of front frames topped off by the larger cap piece. I build a lot of furniture myself but have never really enjoyed the finishing process. 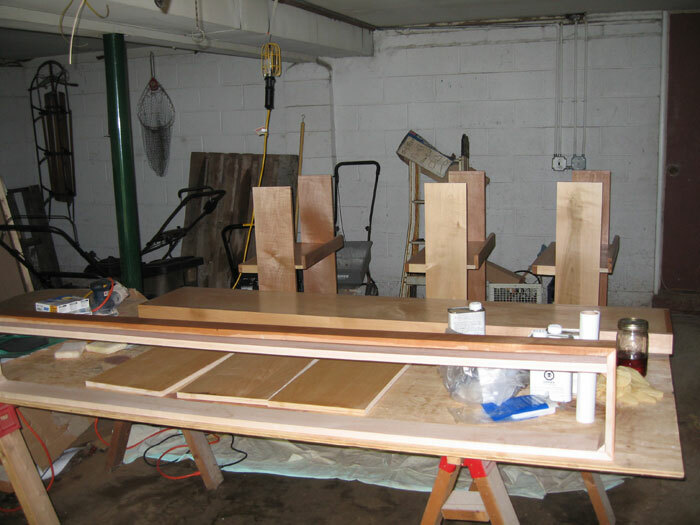 I suggest that for your next project you call around to a few local cabinet shops and find one that will do your finishing for you. For example, mine would finish that project for about $120. Well worth it!